Felix Gravy Pouches are a range of complete, wet adult cat foods in gravy. The gravy selection box contains 12 delicious chunks in gravy pouches that will provide your cat with a different tasty meal every day. This pack contains 3 x Turkey & Liver, 3 x Rabbit & Poultry, 3 x Duck & Lamb and 3 x Chicken & Kidney flavour pouches. The pouches will give your cat a bit of variety in life and he is sure to love every appetising flavour on offer! Meat and Animal Derivatives (of which Turkey 4%, Liver 4%), Cereals, Minerals, Various Sugars. Meat and Animal Derivatives (of which Rabbit 4%, Poultry 4%), Cereals, Minerals, Various Sugars. Meat and Animal Derivatives (of which Duck 4%, Lamb 4%), Cereals, Various sugar, Minerals. Meat and Animal Derivatives (of which Chicken 4%, Kidney 4%), Cereals, Minerals, Various Sugars. For an average adult cat (4kg), feed 3 to 4 pouches per day in at least 2 separate meals. Serve at room temperature. Clean, fresh drinking water should always be available. The adult maintenance averages are based on moderately active cats at normal environmental temperatures. Individual needs vary and feeding should be adjusted as required to maintain your cat at a lean, healthy body weight. 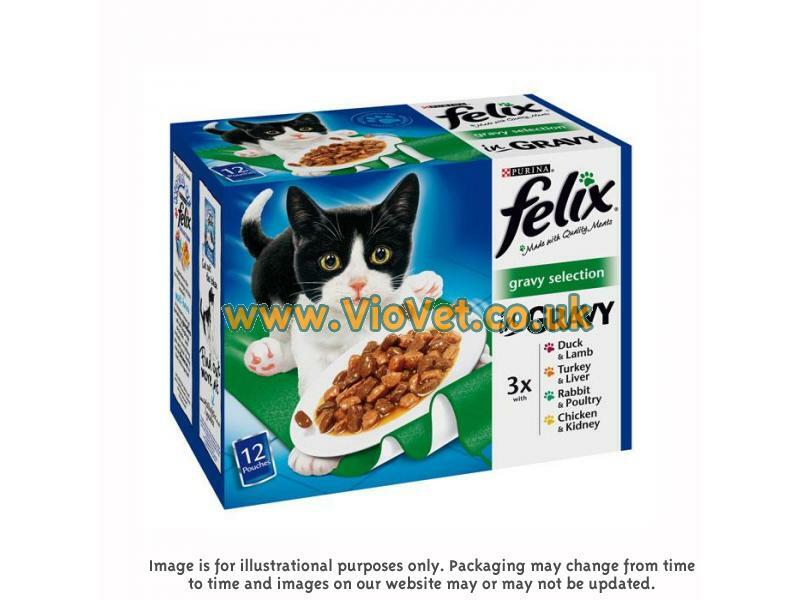 There are currently no questions for Felix Mixed Variety Gravy Cat Food - be the first to ask one!